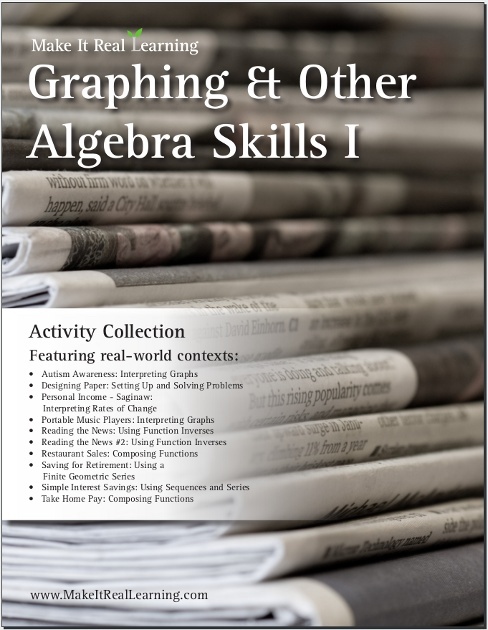 The Make It Real Learning Graphing and Other Algebra Skills I workbook focuses on real-world situations that may be effectively analyzed using algebraic concepts such as graphing, functions, inverse functions, and geometric series. 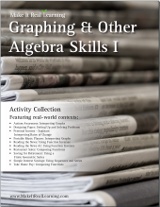 This book suits best grades 7,8, and high school. From designing a paper size to analyzing MP3 player sales, learners get to use basic math skills in meaningful ways. Each activity integrates real world information, companies, and issues (e.g. autism, take-home pay, McDonald's, newspapers as a source of information, MP3 player sales), not just "realistic" data. Find a linear function to fit given data.